I received compensation from Zoup! in exchange for creating this recipe, but the thoughts and opinions are all my own – just as always. Thanks for supporting the businesses that support me! Folks, I’ve always said that cooking delicious food doesn’t have to be complicated or difficult. 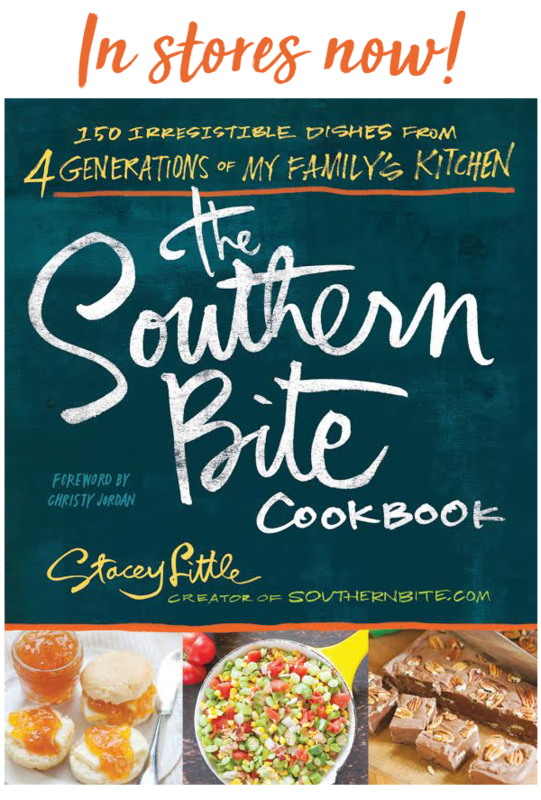 Some of my most favorite recipes are the ones that are super simple and only call for a few ingredients. The disadvantage to that is by using only a few ingredients, you might miss out on opportunities to add flavor. When that’s the case, you want to pick the most flavorful ingredients to make the dish even better. That’s why I absolutely loved using this Zoup! Good, Really Good™ Chicken Broth in this recipe. Now, I never share a product with y’all that I don’t love, but this one is special. From the moment I cracked open the jar, I knew it was different. Y’all, this stuff is amazing. 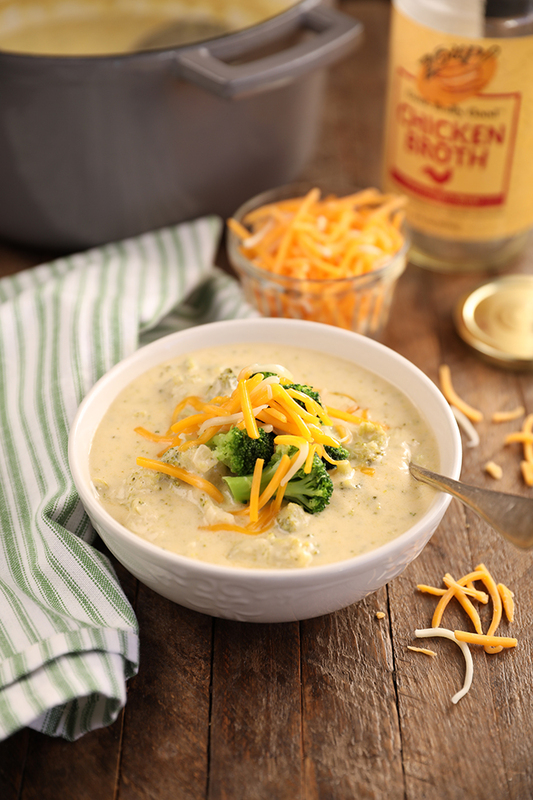 While other broths just kinda smell like, well… broth, this chicken broth smells like savory roasted chicken. It is so rich and flavorful that it’s perfect for just warming and sipping straight from the jar. It’s cooked in kettles in small batches so it tastes so much like homemade. It’s also low in calories, paleo-friendly, and completely free of hormones, gluten, GMO’s, fat, trans fat and saturated fat. Zoup! got its start as a fast-casual franchise of restaurants and now they’re bringing restaurant-quality broth to supermarkets. Now, you might find the broth to be a little more expensive than the cardboard box varieties at your local store, but the difference in flavor is worth the extra – especially when you rely on the broth for the base flavor as in this recipe. Zoup! 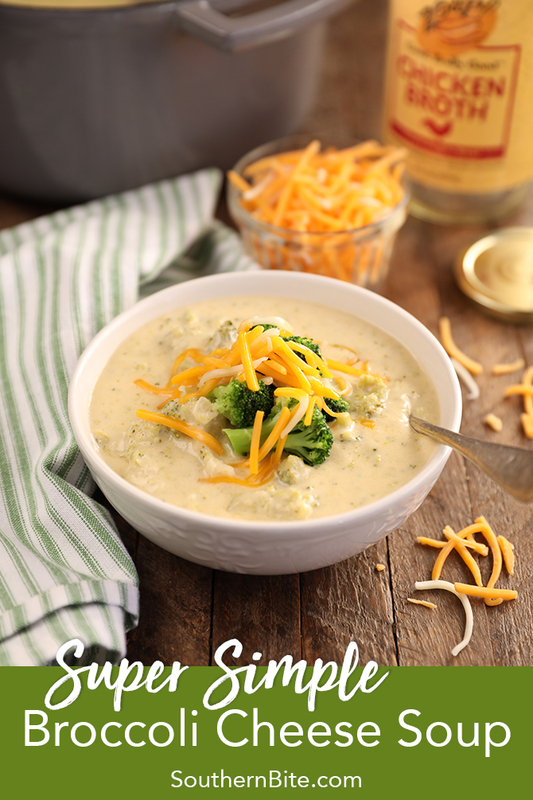 Good, Really Good™ Chicken Broth is the secret ingredient in this Super Simple Broccoli Cheese Soup because it makes it super rich and savory. 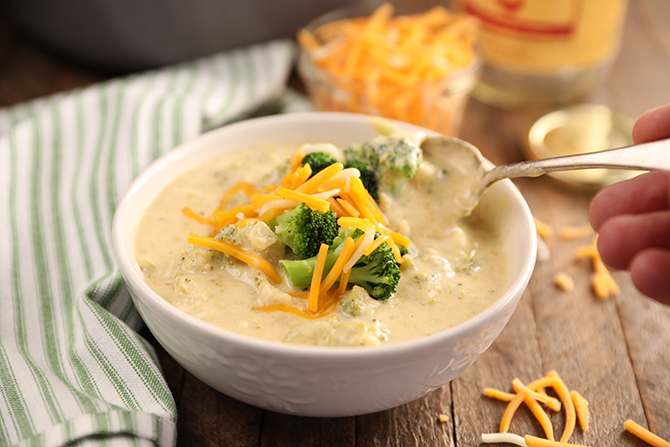 Sometimes recipes like Broccoli Cheese Soup can seem overwhelming with lots of steps, but this one is straight-forward and to the point. 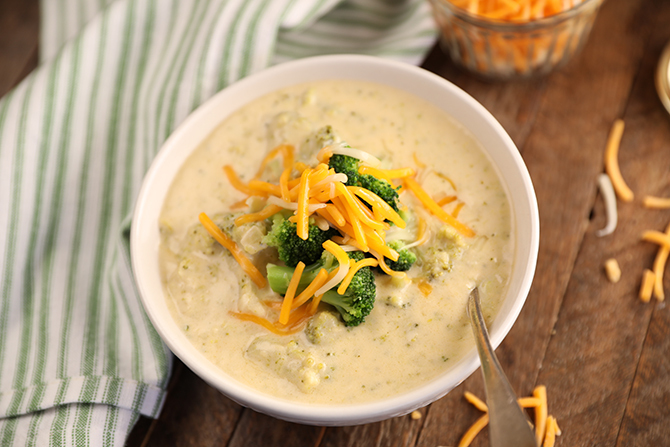 It even calls for frozen broccoli so there’s no need to wash and chop fresh broccoli – and you won’t even know the difference when it comes to flavor! I’ll admit, I normally shy away from frozen broccoli, but it works perfectly here. Even better is you’ll have the whole thing put together in less than 45 minutes. It’s rich, cheesy, and super creamy. Y’all are going to love it! In a heavy bottomed stock pot or dutch oven, melt the butter then cook the onions over medium low heat until tender - 8 to 10 minutes. Sprinkle the flour over and stir well. Cook for about 3 minutes. Gradually add the broth and stir to combine after each addition. Add the half and half, salt, and garlic powder and stir well. Bring to a gentle boil, stirring very frequently, being cautious not to scorch. Add the thawed broccoli and stir well. Cook over medium low until the broccoli is tender. If you prefer a smoother soup, feel free to use an immersion blender to puree some of the soup to a smoother consistency. Add the cheese and stir until it has melted. Add additional salt and pepper to taste. Visit www.zoupbroth.com for a $1 off coupon and find Zoup! Good, Really Good™ Broth at an Albertsons-Safeway, The Fresh Market, Kroger, Rouses, or other retailer near you! You can also visit them on Facebook, Instagram, and Twitter. What a nice soup to try in this weather. Thank you for sharing! Where do you buy zoup? Where do you buy zoup. Hi Tess! 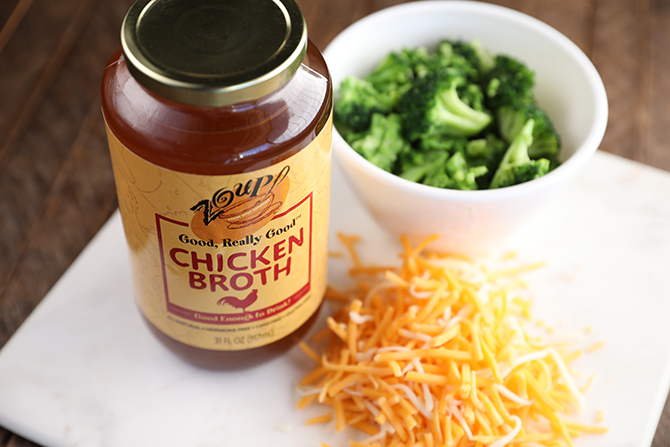 While this recipe was developed specifically using ZOUP!, other broths will work as well. My hubs and I love this soup. I followed the directions exactly, with a couple exceptions. To the onion cooking in the butter I added finely diced carrots. At the last when the cheese was added I also added parmesan cheese. So good. Thanks for an excellent recipe. 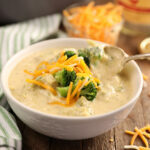 Loved the broccoli cheese soup!! 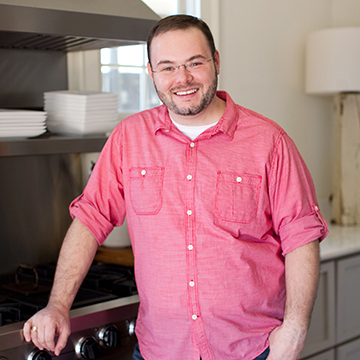 Do you have a recipe for butternut squash soup?! Could this be done in a crock pot? And if so, would I need to make any changes? Sounds wonderful! I’ve not tried it that way, Cindy. I’ve made it on the stovetop and then transferred it to a crock pot to keep it warm, though.